When you only have time for a quickie.This is the first in a series of Local Rides we're presenting here on our blog. If you have a favorite ride you'd like to share contact us for details on how you can submit it. West of Tulsa is a two-lane road that snakes through Creek County between Sand Springs and Mannford. It's called Coyote Trail and it's been a favorite local ride of mine for more than 20 years. 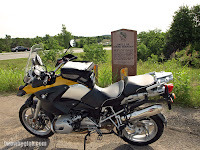 This curvy 14 mile ride is perfect as a scenic route to Keystone Lake from Tulsa. One highlight of the ride is a historic marker commemorating the Battle of Round Mountain. This was the first Civil War battle fought in Indian Territory. Where this battle actually took place has been vigorously argued for many years. Some experts believe it happened more than 20 miles away- somewhere west of Yale, Oklahoma. But the marble marker still stands at the western end of Coyote Trail. Made this ride today, what a wonderful way to spend a 1/2 hour! Grew up on coyote trail...beautiful country...love it.